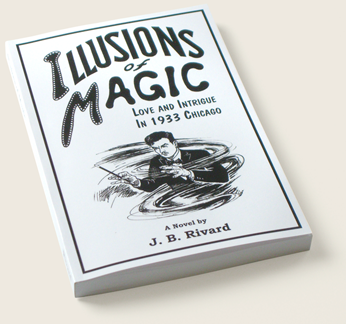 Thanks to the Ingram/Spark program, I’m happy to announce that Illusions of Magic—the novel—is now a print book (ISBN 978-0-9968363-0-2). The back cover has praise from eight different reviewers (for which I’m humbly thankful). The book is available at bookstores everywhere and can be ordered through Amazon, Barnes and Noble, Powell’s, etc. This also means that libraries can now obtain the paperback, so be sure to notify your favorite library of this. Below, as usual, is “Wisdom with a Smile.” This time we observe a situation where mirth is inevitable: a conversation between a father and his teenage daughter. Finally, as explained in the article titled “Historical Writers,” we will be making session presentations in September at the writers conference in Albuquerque sponsored by the Historical Writers of America (HWA). You might consider attending. 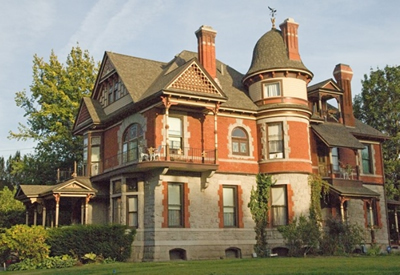 At the historic E J Roberts mansion in Spokane, WA, Monday, May 8 was unusual. From dawn until late at night, dozens of people, some dressed in strange costumes, scurried about, inside and out. They weren’t the usual guests of this city’s B & B—they were there for the filming of a video of themes from my 2016 novel, Illusions of Magic. Assembled by actor-director Wes Deitrick, the actors and film crew used the renovated interiors—and one exterior—to film scenes representing love and intrigue in 1933 Chicago, as found in the book. The cast included Patrick McHenry-Kroetch as magician Nick Zetner, Kris Crocker as his wife and assistant Connie, Amy Sherman as Iris, his rediscovered love, and Wes Deitrick as the enigmatic banker who persuades Nick to undertake a risky venture recovering items taken during a burglary. Headed by Co-Directors Deitrick and Jesse James Hennessy, the Production Unit utilized the basement and the first two floors of the three-story mansion, built in 1889. Scenes of actors performing onstage, in a backstage conflict, bargaining in the banker’s home, or meeting at a speakeasy, as well as other tableaux were filmed. The camera work was led by Jade Warpenburg, Director of Photography, assisted by a sound man, gaffer, grip, production and director’s assistants, properties person, costume designer, make-up and hair artist, and other essential workers. Also working the shoot was John Austin, still photographer. He recorded behind-the-camera action, as well as documenting the costumed actors as they awaited cues for their on-camera performances. One such actor is shown here on the rightabove—Amy Sherman, playing Iris. It was my first experience at a professional film shoot. I found it fascinating, watching the action as Deitrick, Hennessy and Warpenburg conferred with actors and crew as they supervised the setup of lighting, sound and camera for each shot. Another unexpected pleasure was observing the skill of the actors as they repeated their lines, sometimes a dozen or more times, allowing the camera’s position to be changed, for example, from medium to close-up, or from one actor to another in a scene. One of the most skilled of the actors is Kris Crocker, a local television star, shown here (on the left)(above) in another photo taken by John Austin. She’s costumed in the harem dancer outfit she wears as assistant to magician Nick Zetner (in the novel). Following this production, the several hours of digitally-recorded film will be processed into shorts publicizing the novel, the screenplay, and our forthcoming movie book. One evening recently we took the chance afforded by TV’s Turner Classic Movies to watch an outstanding film from 1961. With the unlikely title of “Breakfast at Tiffany’s”, it stars Audrey Hepburn as Holly Golightly, a role which won her an Oscar nomination. The screenplay by George Axelrod, which is based partly on Truman Capote’s 1958 novella of the same name, depicts Holly, a twenty-ish slip of a woman, gyrating in the whirl of New York nightlife. The story’s outline doesn’t differ significantly from many Hollywood dramas of the time—a woman making her way in the big city, boy meets girl, etc., etc. The etching of Holly’s character, however, is of a different sort altogether. Henry Mancini’s hummable (and Oscar-winning) song, “Moon River,” plays as the movie opens. On a deserted, near-dawn street in midtown Manhattan, a taxi drives to the curb and stops. Holly steps from it beautifully coifed and jeweled, dressed in a chic black evening gown. The taxi pulls away and she glides, with her back to us, to a jewelry store window. The camera shifts to an overhead sign engraved with “Tiffany & Co.” Holly inspects the jewelry in the window, opens a small paper bag she carries, withdraws a pastry and takes a bite. She lifts a paper cup from the bag and sips (presumably) coffee. Aha!—this is breakfast at Tiffany’s. As can be guessed at this point, Holly’s nights extend far into morning. She lives in a walkup where Paul (the ever-handsome George Peppard), who’s newly moved into an apartment above her in the same building, interacts with her. She’s often accompanied home from outings by men, including a Hollywood agent named O. J. Berman. Berman describes her as “a phony…but a real phony.” He evinces partial ownership of Holly, to whom he’s often given fifty-dollar-bills for her trips to nightclub powder rooms as well as for cabfare home. Although the generosity of many gentlemen contributes to Holly’s income, she’s a plucky social butterfly rather than a prostitute. And, as we later learn, her escorts’ charity is not her only source of income. The party is eventually interrupted by Holly’s upstairs neighbor, played by a ridiculously made-up Mickey Rooney, bucktoothily overacting as Mr. Yunioshi, who calls the cops. This party is the first witnessed by neighbor Paul, who Holly insists on calling Fred—for her beloved brother whom she says Paul resembles. Paul is further confused when he learns that Holly, blithely unaware of any deceitful aspect in the ‘weather reports,’ is paid a hundred dollars by Sally’s lawyer each week for reporting back to him the words in Sally’s meteorological message. Despite Paul’s apparent disquiet, it turns out that he, a struggling writer with little success, is himself receiving funny money. His benefactor (Patricia Neal), a married business woman who had elaborately redecorated his apartment, so enjoys his overnight company she insists on leaving hundred dollar bills on his table before exiting the apartment. The movie’s dramatic setup is now complete: boy has met girl whom he thinks he likes. Girl responds favorably to the offered friendship, but continues to pursue men of apparent wealth. Other obstacles loom. An unexpected guest interrupts when Doc Golightly (Buddy Ebsen), a horse doctor from Texas, arrives at Holly’s door. He says he’s Holly’s husband, though she claims the marriage was annulled. She doesn’t deny they married when she was 14 and lived with her beloved brother Fred and four children that she adopted. She also admits she’s not seen Fred, the “six-foot-two, sweet, vague, poor Fred,” she adores, for years. “She’s an exceptional person,” Doc says. He can’t understand why she “run off like she did.” But now that Fred is being released from the army, as he patiently explains, her place is back in Texas with him and the family. “You’ve always loved a wild thing,” Holly tells Doc. She and Paul accompany Doc to the bus stop, where she tells Paul she won’t return with Doc to Texas. “I can’t,” she says. As she faces Doc with a pained expression, she says, “Please understand, Doc. I love you, but I’m not Lula Mae anymore.” Doc, defeated, nods and begins his bus trip to Texas alone. As Paul falls steadily more in love with Holly, she continues her determined pursuit of men of apparent wealth. One day she sings “Moon River” to Paul on the fire escape outside her window. As she lingers on John Mercer’s lyric, “…we’re after the same rainbow’s end,” she smiles wistfully, perhaps recognizing the illusory aspect of her desperate quest. Paul eventually breaks off his relationship with the decorator and even finds modest success as a writer. Holly, however, becomes attached to Jose’, a seemingly rich and courtly Brazilian, whom she intends to marry. She tells Paul she is “really, really happy” at the prospect, even though Jose’ hasn’t asked her to marry him. The movie concludes happily in the standard Hollywood mode, though not without difficulties, some touching, in its closing moments. Teen (smiling): Dad, do you know what the most common letter in a girl’s name is? Dad: Hmm. Consonant or vowel? Dad: You do know the difference between consonants and vowels, right? Teen: Sure, Dad. But forget I brought it up. The Historical Writers of America (HWA) is a nonprofit organization advancing the professional interests of historical writers, fiction or nonfiction—those writing for stage, TV or movies, magazines, or online; textbook authors as well as novelists and essayists. Through networking and education, HWA seeks to encourage and celebrate quality writing. Its website is www.historicalwritersofamerica.org. HWA’s annual conference will take place this coming September 21-24, near Albuquerque, New Mexico at the Hyatt Regency Tamaya Resort & Spa. This location in the Land of Enchantment also offers the opportunity to visit nearby Santa Fe, Indian Pueblos, ruins, and other fascinating historical sites. The Conference’s multiple sessions are designed to help fledgling writers as well as accomplished professionals. They’ll cover publishing issues, journalism, nonfiction, mystery, playwriting, romance, screenwriting, YA fiction, and marketing. Attendees will enjoy the opportunity to exchange views with other writers, literary agents and editors. Events will include a keynote dinner, book signings, exhibit floor and a bookstore. Guest speakers and a number of agents and editors have already signed up.